The 2019 AFC title game is one of the most fascinating matchups of the season. The Chiefs won the No. 1 overall seed in the conference, while the Patriots were No. 2. Patrick Mahomes is the likely MVP of the league, and Tom Brady has won that award three times. Kansas City had the NFL’s highest-scoring offense, one that resembles the 2007 Patriots in terms of their ability to create big plays downfield and score from absolutely anywhere. The Patriots have the NFL’s best defensive coach and one of its top offensive schemers in Bill Belichick and Josh McDaniels, while the Chiefs have offensive maestro Andy Reid. The Belichick-era Patriots have been to the Super Bowl nine times and won five of them, including one against Reid when he was with the Eagles. Reid’s never won one, and the Chiefs franchise hasn’t taken home the Lombardi Trophy since 1970, which is before the trophy was actually named the Lombardi Trophy. Kansas City hasn’t even been back to the Super Bowl since that game, while the Patriots have been there twice more than any other team in the league. In a clash of AFC titans, who will be victorious? We’re glad you asked. The Chiefs are three-point favorites as of Friday, with the over/under at 56 total points. This is what you should watch out for in the AFC Championship Game, which you can stream on CBS All Access or watch on CBS at 6:40 p.m. ET on Sunday. Who wins Patriots vs. Chiefs? And which side of the spread cashes in nearly 60 percent of simulations? Visit SportsLine now to see which side of the Patriots vs. Chiefs spread you need to jump on Sunday, all from the computer model that has returned nearly $4,000 to $100 bettors over the past two seasons. If this feels a bit like deja vu, well, it sort of is. In this space last week, we highlighted how the Colts would have to control the ball with a strong ground game against the Chiefs’ 32nd-ranked run defense if they wanted to keep Patrick Mahomes and company off the field and come away with an upset victory. And while the same principle applies to the Patriots, they actually have two different backs with whom they can orchestrate a ball-control offense, and those two backs and get it done in two vastly different ways. Coincidentally, we saw them do exactly that last week against the Chargers. 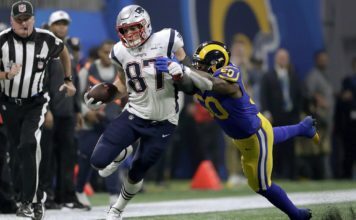 In New England’s blowout victory, Sony Michel ran 24 times for 129 yards and three touchdowns, while James White didn’t record a single carry but managed to catch 15 of 17 passes thrown in his direction for 97 yards — acting as an extension of the run game in a manner that perhaps even he never quite had before. Considering the Chiefs’ style of defense, the strengths and weaknesses of Bob Sutton’s unit, and the Patriots’ personnel, it seems likely that the key to the Pats pulling off a road upset involves Michel and White once again doing what they do best, as well as they possibly can. As previously mentioned, the Chiefs ranked 32nd in the NFL this season in run defense (per Football Outsiders’ DVOA). The Kansas City run defense stopped only 15.8 percent of opponent runs at or behind the line of scrimmage, per Football Outsiders, the sixth-worst mark in the league. 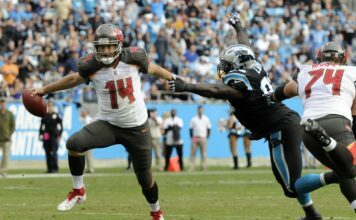 They also allowed conversions on 78 percent of running plays on third or fourth down with two or fewer yards to go, third-worst in the league; and they ranked dead last in both Adjusted Line Yards and second-level yards allowed per carry, indicating that they routinely got blown off the ball by opposing offensive lines and they did not do a good job of tackling once ball-carriers broke through the line of scrimmage. Worse yet for Kansas City, they struggled most to defend the run against the Patriots’ two most-common personnel groupings: 11 and 21 (11 = one running back, one tight end, three receivers; 21 = two running backs, one tight end, two receivers). The Chiefs yielded 5.2 yards per carry to teams running out of 11 personnel, which typically forces defenses into light formations; and 6.0 per carry to teams that ran out of 21 personnel, which allows for heavier defensive formations but also provides the back with a lead blocker to clear the way. It doesn’t help them that New England’s offensive line was among the best in the league at clearing lanes for running backs, ranking third in Adjusted Line Yards and fourth in the percentage of runs stopped at or behind the line of scrimmage (15.9 percent). They were not quite as successful in power situations (58 percent, 29th in the NFL), with the Patriots often going to a jumbo set and attempting to run right up the middle, and failing. They have the option to sneak with Brady, perhaps the most effective QB-sneaker in NFL history, as well as getting White or Julian Edelman out into open space on a pick route behind a bigger receiver like Rob Gronkowski, Chris Hogan, or Cordarrelle Patterson. The Chiefs have several defenders who can make plenty of plays in the run game, as we saw was the case from the very first snap last week when Dee Ford shot into the backfield and quickly dropped Marlon Mack for a three-yard loss. The Chiefs held the Colts to less than 40 yards rushing for most of the game, and they accumulated the majority of their 87 total rushing yards in the fourth quarter, when the game was nearly out of hand. Between Ford, Justin Houston, Chris Jones, Derrick Nnadi, and Allen Bailey, the Chiefs have players who can make an impact in this arena; we just didn’t often see it during the regular season. If they devote the appropriate resources to it, though, it can be done. White is also no ordinary pass-catching back. He is perhaps the most prolific pass-catching back in the league, and for much of this season operated as Brady’s de facto No. 1 receiver. They will throw to him in any situation, pretty much anywhere on the field. He most often checks down right in front of Brady and shakes a defender or two to gain a few extra yards, but he also excels at option routes, quick-ins and quick-outs, and can be split out wide or lined up in the slot, where he’ll run the entire route tree of a natural receiver. He is a remarkably tough cover. Just ask the Chargers. As much as the Chiefs’ defense doesn’t seem especially well-equipped to deal with the Patriots’ running backs, it is even more difficult to see a path that leads to the New England defense stopping Mahomes and the Kansas City offense. Even in the first matchup where Mahomes missed several throws that he usually hits and threw two uncharacteristically silly interceptions, Kansas City put 40 points on the board and it took a last-second field goal for the Patriots to beat them. And looking at the throws Mahomes missed last time, as pointed out by our own Sean Wagner-McGough, does not provide much confidence that he’ll miss them again. New England’s pass defense has notably improved since the last time these two teams played, but that improvement has come with a secondary that plays more man coverage than any team in the league, doing so on more than 50 percent of opponent passing plays. New England allowed a passer rating of only 80.6 on those plays, per Sports Info Solutions, the third-best mark in the league. That’s great. This isn’t: This may shock you, but Patrick Mahomes absolutely lit up defense that played man coverage against the Chiefs. Specifically, Mahomes had a preposterous 130.5 passer rating when throwing to Tyreek Hill against man coverage, the sixth-best mark out of 102 receivers who were targeted against man defenses 25 or more times. Hill led the league in deep catches (20), deep receiving yards (754), and deep receiving touchdowns (seven) while also posting the second-highest catch rate among the 20 wide receivers with 20-plus deep targets. Oh, and he beat the Patriots for seven catches, 142 yards, and three scores in the first matchup between these two teams. Most often, those quick-strike throws come soon after the snap. And it’s on those in-rhythm tosses where Mahomes really shined. He was the best quarterback in the NFL when throwing the ball within 2.5 seconds of the snap, per Pro Football Focus, recording a completely ridiculous 129.7 passer rating across 323 such throws. New England’s best chance of withstanding the aerial assault Mahomes and company routinely engage in is getting quick pressure in his face and forcing him to run around and make plays off-schedule. Mahomes can do that, of course, and better than almost anyone else in the NFL. He just doesn’t do it quite as well as he picks teams apart from the comfort of the pocket. (Almost nobody does.) Getting pressure was a surprising strength of this New England defense; they recorded a sack, hit, or hurry on 37 percent of opponent drop-backs, per Pro Football Focus, an above-average mark. They got pressure 36 percent of the time when rushing four and 45 percent of the time when rushing five or six, indicating that their blitzes were often successful. Against Mahomes and this particular Chiefs team, mixing up where the rushers come from may be even more important than how many players rush. Mahomes had an utterly absurd 124.6 passer rating against blitzes, which most often just opened up wider windows through which he could throw his quick-strike passes, but on plays where pressure actually broke through his offensive line, his completion percentage dipped below 50, his touchdown-to-interception ratio was almost even (nine to eight), and his passer rating plummeted from 134.2 (DANGER!) to just 70.4, the largest drop-off among playoff passers. The Chiefs even have responses to heavy pressure, though, as they have arguably the best screen-and-short game in the NFL, whether throws screens are quick throws to get Hill or Watkins or Demarcus Robinson the ball on the perimeter, middle screens or shuffle passes to get Kelce the ball on the move, or regular ol’ running back screens to get Damien Williams or one of the other backs into open space behind the Chiefs’ strong offensive line. In the end, it just seems like they have too many ways to move the ball, and can’t really be stopped unless Mahomes simply makes mistakes. And he doesn’t usually make mistakes.